Law student Lex Trent’s world is inhabited by fearsome magicians, ageing crones and a menagerie of Gods and Goddesses. And while Lex is seemingly dedicated to his legal studies he’s always enjoyed a challenge – which is why he leads a double life as the notorious cat burglar ‘The Shadowman’ who has been (luckily) evading capture for years. But Lex’s luck is about to run out because the Goddess of Fortune has selected him to be her player in the highly dangerous Games. Losing is not an option for Lex (particularly as it so often involves dying) but can he really win each of the perilous rounds? Given that the reward for doing so is money, fame and glory – all things that Lex is quite keen on – he’s going to do whatever it takes to make sure he will… and he’s certainly got good experience of cheating. Stand alone or series: First in what seems to be a VERY promising new series! Why did I read this book: A YA novel from an author whose previous novel I loved, with a protagonist who is an anti-hero facing Gods? I AM SO THERE. There is a sort of an instinctual reaction, or chemistry even, between a reader and an author’s books that doesn’t happen always and thus it is a very rare and precious thing. That Je Ne Sais Quoi, which is partly unexplainable, happens between Alex Bell’s books and I. We just sort of ….click. First it was Jasmyn and I loved that book so much because it had those elements I adore: fairytales and an unreliable narrator, and romance and darkness but not enough darkness to make it dreary. 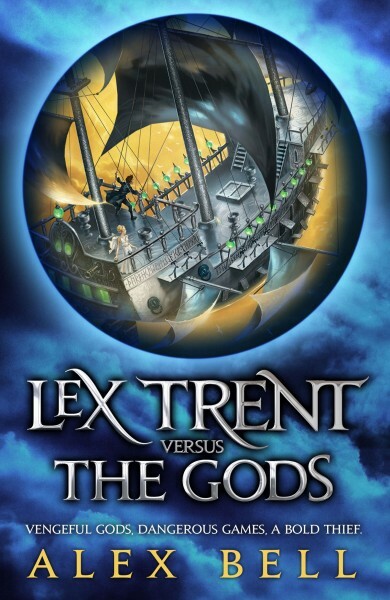 Then comes Lex Trent Versus The Gods and the two books could not be any more different and yet here I am loving this one as well because it also has elements that I adore: the unrepentant scoundrel anti-hero, the non-stop adventure and Gods being busybodies. It is almost like she reads my mind and decides to write books especially made for me. It is uncanny. Lex was sure he would excel at pretty much anything he put his hand to. It wasn’t arrogance. It would only be arrogance if you didn’t know you were a multi-talented genius. But there was no else like Lex – he was the best at everything. Everything. Meaning that Lex Trent portrayal’s is the epitome of the Anti-hero: he is really and truly arrogant, selfish, sneaky. There is no sugar coating : this is no redemption story. It is what it is, a cool, fast-paced adventure of a 17 year old guy who thinks himself the greatest thief who ever lived. If that is true or not, remains to be seen ( he likes to think so though and repeats to himself over and again how great he is. Poor Lex, repetition does not a truth make). Definitely not a book for everyone, especially not for those who want a definite separation between black and white, this will not be found here. Possibly the most important fact about an anti-hero is how they are, generally speaking, almost a villain but one that didn’t make quite it to VillainyVille. Either because of their motivations, or because their hearts are not evil, or deep in their souls they love puppies (or griffins), something makes an anti-hero likeable even if it is just that combination of charm and daring. Alex Bell wrote her story in way that her character was disclosed to the reader, little by little via small windows to his soul – his motivations, if we can call them that, might not excuse his behaviour but to me went a long way to make him likeable and more sympathetic. As to whether the same can be said for every reader, it will most certainly depend on who is reading the book. And this is another fantastic aspect of this novel: that even if, as first glance it is an adventurous romp, it also engages the reader and requires a response on another level: who are you as a reader and how far are you willing to go to accept your protagonist? Does he even need to be accepted at all? One can even say that the very nature of literature and the rapport between reader and book is at balance whenever an anti-hero shows up. And I simply love that. On another level Lex Trent versus The Gods it is just a plain good book. And with an incredibly creative world-building and a great self-contained story. Lex Trent after going on the run discovers that he has been chosen to be one of the players in the infamous Games: played by hree Gods who picks three humans to compete against each other; Lex is chosen by the Goddess of Fortune (even though he would love to have been chosen by the God of Wit and Daring). In this world they inhabit, Gods play with humans’ lives at will, there are four suns, the Globe is split in the Lands Above and the Lands Beneath and they separated by Ladders – there are also magicians, and gypsies and Kings and fairy godmothers who retired to a village far away because they are sick and tired of granting wishes. It is an incredible mixture of Greek Mythology and Alex Bell’s mythology. From a scene where Lex stands between a rock and a hard place (or a medusa and a gladiator) to flying a ship with his mind, to facing what he fears the most, to some other people that appear in the book ( I am being elusive on purpose), to the twists and surprises and details that matter (everything that Lex says or thinks has a reason), for all that, Lex Trent Versus The Gods was a damn good read. Don’t let he hear me say that: he is not quite there yet, but one day Lex Trent might well be one of the most Awesome Thieves and Adventurers ever. No one knew the precise date when the Globe had split in half. For many hundreds of years the Lands Above and the Lands Beneath had been nothing more than a metaphorical, symbolical divide. But then, one day, the Gods decided that they had had enough – more than enough, in fact – of their subjects complaining and pestering and whining at them day and night. Being the focus of so much worship can be a tiring business. The Gods needed somewhere that would be quiet – a place they could call their own. And thus, one fateful day, the earth shook and trembled and a great split appeared right across the centre and then the two halves cracked apart like a giant, cosmic, galactic Easter egg. No one alive today could remember the Great Divide, of course, for it had happened many millennia ago now. One might think the planet had never split in half at all had it not been for the ladders . . . Physicists had happily debated for hours on end how the split was even possible, for the general consensus seemed to be that the planet had been spherical once but now . . . now it was more like a . . . well, like a dumbbell – those weights that impressive-looking men use to make themselves look even more impressive. A dumbbell that had been stood up vertically. The top weight was the Lands Above, the bottom weight was the Lands Beneath and the bar in the middle was the ladders stretching between the two discs. If you travelled to a certain place in the centre of the Lands Above, you could look down over the edge and see them – thousands and thousands of ladders stretching away through space, linking the top of the planet to its bottom half – the province of the Gods. It was a breathtaking, awe-inspiring sight. Some of the ladders were solid, built of wood and metal and attached to platforms below. Others were no more than rope ladders, waving lightly in the breeze and dusted with space frost. Just as physicists had debated the mechanics of the Split itself, philosophers had argued heatedly about the theological significance of ladders being used to join the two halves of the planet together. After all, it seemed a most curious choice when the Gods had forbidden people to ever attempt the journey down to the Lands Beneath. If they truly didn’t want people climbing them then why not use poles or wires or anything other than ladders? It was like giving a fat child a gigantic chocolate lolly and sternly telling him he must never lick it . . . Some said the Gods had used ladders as a test or a temptation or a trick or some other grandly significant theological, symbolical, philosophical form of gesture. Others said it was just because Ladderworld went into liquidation around that time as a consequence of being supremely dull and so there was a surplus of raw materials readily available. the Space Ladders to the Lands Beneath when the only things down there were teeth, tentacles and wrathful Gods waiting for them with lightning bolts. There had to be better things to risk your life for. But . . . but . . . there were also tales of treasure, because there always are. The most beautiful, breathtaking, golden treasures they had down there. And it is a well-known and universal rule that there will always be – has always been – one stupid sod whose strength of greed outweighs their common sense and suppresses that all-important instinct of self-preservation. Additional Thoughts: Later today, we interview Alex Bell on everything about Lex Trent! Be sure to come back! Verdict: An excellent story, with a protagonist who is the epitome of the irreverent scoundrel set against an inventive mythological world, what is not to like? I know I’m going to love this one – I am impressed by Ms. Bell’s writing, and this one (which goes into new territory for her – YA!) is right up my alley. Can’t wait to read it! Great review, this sounds really good! Eek, that reminded me that I still need to read Jasmyn (which also sounds very good). Sounds a bit like a cross between Colfer’s Artemis Fowl and Riordan’s Percy and the Lightning Thief.